Less than three hours from Colorado Springs lies the agriculturally rich San Luis Valley, cradled by majestic peaks. As part of an interconnected web of food hubs, RFD’s food distribution arm, Peak to Plains Food Distributing, sources unique products from the valley and makes them available to discerning customers across the state and beyond. The area is best known for its potatoes; Ranch Foods Direct carries the valley’s premier spuds, including russets grown by White Mountain Farm, the oldest organic farm in the valley. 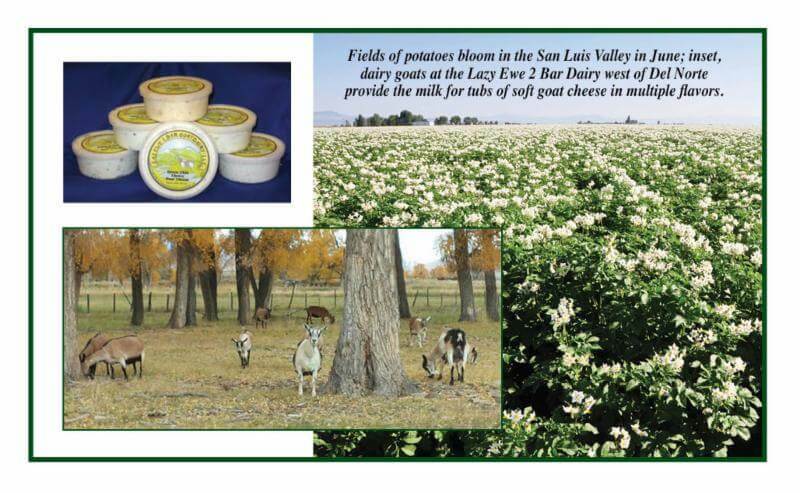 Up the road along the western rim is Lazy Ewe 2 Bar Dairy, one of the craft cheese-makers featured at the recent Colorado Artisan Cheese Fest, hosted by Springside Cheese, and held in Pueblo. (There were 800 festival tickets available and the event sold out!) You can find Lazy Ewe 2 Bar’s spreadable goat cheese in the dairy case at Ranch Foods Direct.